Ten things you need to know about Swift verruca treatment. Verruca is the Latin word for wart. There is no difference between a verruca and a wart and the terms are interchangeable usually depending on location. There are approximately 150 different human papilloma viruses (HPV) some rare, others more common, causing warts on different parts of the body. HPV have been with us for thousands of years and are highly adapted to human skin and mucosa. Warts/verrucas may have many presentations and can appear on any epidermal surface. They are generally transmitted via direct contact, but may also transmit indirectly, however, the virus will not affect tissues deeper than the basal (bottom) layer of the epidermis. At Maidenhead Podiatry, our Podiatrists may treat warts/verrucas on the hands and feet. Microwaves love water and when the electric field is applied, local water dipoles (H2O) try to align with field but lag slightly behind causing collision between molecules and therefore generating heat. There are contra-indications to Swift but outside these anyone who has warts/verrucas on their hands or feet can benefit. Young children – treatment on children under ten years old may not be appropriate for a number of reasons which one of our Podiatrists will discuss with you during your consultation. Can anyone have Swift verruca treatment? With a few exceptions, (see above) most people with verrucas and warts should be able to have this treatment. Your Podiatrist will carry out assessment prior to treatment and advise you accordingly. Swift is suitable for most people with few exceptions, although the purpose and reason for a consultation prior to treatment is to identify anyone for who it may not be appropriate. One of our Podiatrists will discuss any concerns with you. As regression is established the verruca will shrink in from the edges at the same time as reducing in thickness – or ‘debulking’. A follow up visit will allow one of our Podiatrists to evaluate any changes and make a decision on whether or not you require another Swift application. How many Swift verruca treatments will I need? This depends on how you respond to treatment. Some resolve within three treatments but more may be needed particularly with large or multiple lesions. These can be from 14 days to over a month apart depending on progress. Your Podiatrist will discuss this with you. When the virus enters the skin, some people’s immune systems immediately respond by producing antibodies and killing it dead. Others don’t and a verruca forms. However, the necessary immune response can still happen at any time, and, days, weeks, months or years later, the verruca can suddenly disappear. This is why your GP will tell you to leave it alone and it will go away in time. Having a verruca does not mean there is anything wrong with your immune system. Swift is designed to prompt that local immune response for the body to heal itself. 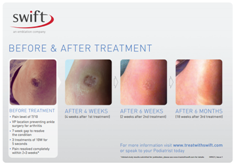 Swift treatment results in a degree of localised tissue damage prompting a healing response part of which is antibody recruitment. It is also thought to stimulate heat stress protein production which is known to prompt a strong healing response. Patients who are immune-suppressed are at risk of developing multiple, resistant lesions, which are difficult to treat. Swift treatment consists of timed bursts of microwaves, usually up to five seconds. 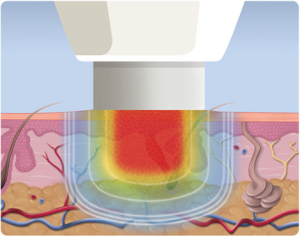 Treatment is applied in timied bursts and can be applied to one or multiple sites with a short pause between each application. 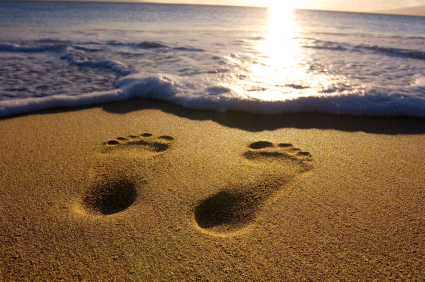 The number of sites to be treated can be discussed with one of our Podiatrists. Does Swift verruca treatment hurt? 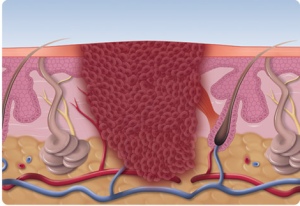 As with many treatments for skin lesions, some discomfort, even pain may be experienced during treatment. Sensation varies from person to person but most people undergoing Swift describe it as similar to a prick with a needle although some may find it more painful. 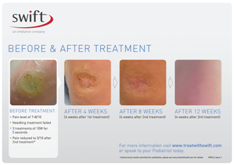 Swift is applied for up to 5 seconds at a time and any discomfort usually lasts 1-2 seconds then quickly subside and disappear. In rare cases some minor discomfort or tingling may be experienced for 24hrs before dissipating completely. What can I do after Swift verruca treatment? Normally any pain or discomfort ends as soon as the treatment is finished but it is possible there may be some minor discomfort. However one of the great things about Swift is there is no broken skin, also no dressings and no need to keep it dry. Therefore you can do anything you wish. Swim, shower, run, jump and play. Does using swift verruca treatment mean that the verruca won’t come back? Once the wart/verruca has gone, it is usually gone for good. However, even though Swift works by prompting an immune response and production of the appropriate antibodies communicating a degree of immunity, there can never be a guarantee that you won’t catch another at some point in the future. Swift is now in use at Maidenhead Podiatry. 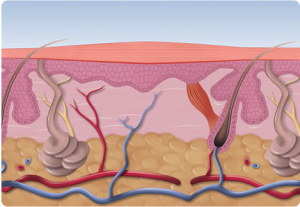 For more detailed information on verrucas and other verruca treatment options in general click here and for (dry) needling click here.